I was associate director of the Janesville Public Library in 1981 when the phone call came to my desk. Sue was looking for a master of ceremonies to host a fundraiser at St. William Grade School. Our conversation revealed that she and husband Phil, a couple of local folk musicians, were teaming up with Dan and Roxanne, another folk music duo, for an evening of song and dance to raise some money for the school. Dan and Roxanne had achieved some notoriety in the Midwest folk community with the release of their album of traditional songs, From Far and Near. It didn’t take much arm-twisting before I agreed to meet with them over the weekend to discuss a plan. Sue was standing in her yard waving when I pulled up to the curb on Saturday afternoon. I closed the car door and followed her into the house where we walked up some steps to the kitchen. Just as my nose was greeted by the aroma of fresh-baked oatmeal cookies, my ears were assailed by an electric guitar plunking out the opening chords to Elvis’ Jailhouse Rock. I swiped a cookie from a plate on the kitchen counter and moved stealthily around a doorway into the dining room. The table and chairs had been removed and replaced by people, guitars, amplifiers and other assorted goodies. A full drum set complete with a drummer introduced as Jim, and a guy named Steve who gripped a harmonica, were in the room also. A couple of P.A. speaker columns and some microphones were spread about where the dining table would have been. “How well do you know your fifties trivia?” added Dan. “I know my stuff,” I replied confidently. We took it from the top and went full throttle. I did my best Elvis imitation. I’d advanced from MC to full-fledged band member in the time it took to eat one oatmeal cookie. Over the next two weeks we rehearsed until we’d mastered a passable set of classics that included a little doo-wop, a few girl group songs, one tear-jerker and a bunch of good old rock ‘n’ roll. We even composed an original song, The Ballad of Heavy Chevy. But perhaps the most important thing we did was assign more fifties-sounding nicknames to ourselves. So let me introduce to you the Circuit Riders: Dapper Dan; Foxy Roxy; Runaround Sue; Philadelphia Phil; Steve-o-reno; Slim Jim; and yours truly, Heavy Chevy. I was thrilled to be singing with these seasoned musicians. After a wildly successful fundraiser at St. William school, Heavy Chevy and the Circuit Riders carried on for a while, working more fundraising gigs around Janesville. It was a blast, daddy-o! 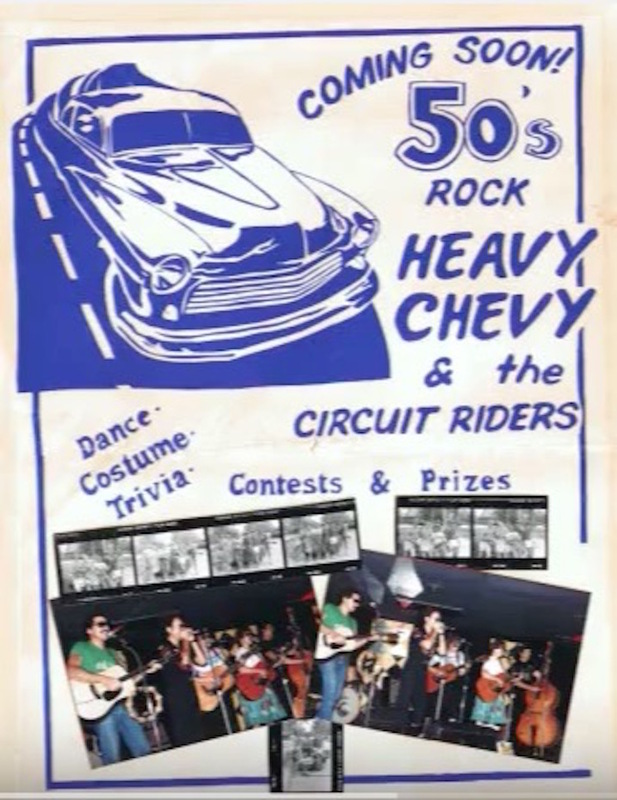 And while I’d feared sharing this with you out of utter embarrassment, here’s a link to Heavy Chevy and the Circuit Riders starring in their music video, The Ballad of Heavy Chevy. Oh my gosh, LOVED this! The video was classic…..especially the plaid jacket! You guys were pretty dang good, for sure! Thanks so much, Judi! It was really fun! Really enjoyed this, Joe! Keep on keepin’ on, man! Thanks, Jeff! Glad you liked it!